But there is also another kind. This is where falling costs and increasing efficiency of production create a glut of consumer goods and services. In other words, supply persistently exceeds demand. This is the world described by Larry Summers – a demand-constrained world. He describes it as “secular stagnation”. Some people regard this sort of deflation as benign. After all, consumer prices are falling, people need less money in order to live well….what’s not to like? Well, it depends on your perspective. In this world, if you are fortunate to have a well-paid job, you can indeed live well. But this sort of deflation causes unemployment. Or if it doesn’t, it pushes down wages in lower-skill jobs. After all, for production costs to fall, either there must be fewer people earning wages, or wages must be lower. So we end up with a bifurcated labour market – those in high-skill, well-paid jobs, who enjoy a rising standard of living, and those who are either unemployed or in poorly-paid low-skill jobs, who become increasingly dependent on state support. Government welfare expenditure therefore rises. However, the well-off don’t like paying taxes to support the unemployed and the low-paid, so they use their electoral muscle to pressure governments to cut welfare bills. As welfare bills are cut, poverty rises among the unemployed and poorly paid. Governments may adopt draconian measures to force the unemployed into work, even at starvation wages, and to quash civil unrest. We have seen this sort of deflation before. During the “Long Depression” in the latter part of the 19th Century – the period regarded as a “golden age” by supporters of the pre-1913 gold standard – labour markets in Europe and the US were actually depressed. As this paper explains, the second Industrial Revolution vastly increased production, resulting in falling consumer prices across the developed world. Wages were very low and there was widespread unemployment: US unemployment in 1873-4 touched 25%. Nowadays we would not call the Long Depression a “depression” at all, since there was never negative growth as such. In Europe it is perhaps more correctly described as a Long Stagnation, and in the US….well, the US experienced growth of 3-5% throughout that period. It’s just that the benefits of that growth did not reach the unemployed and people on very low wages – exactly as is happening now. So what happened? There was widespread civil unrest over unemployment. In response to this, countries adopted protectionist measures to support domestic employment, and searched desperately for new export markets to unload their excess supply. In Europe this took the form of imperial expansion. But monetary policy was unsupportive. The US tightened monetary policy in order to return to the Gold Standard after the civil war. And the entire period was characterised by scarcity of gold, not just in the US. France was particularly hard hit because it was paying reparations to Germany after losing the Franco-Prussian war, and was therefore borrowing heavily even before the stock market crash that signalled the start of the Long Depression*. The failure of aggregate demand at that time was a combination of what we might call supply-side extravagance with tight monetary policy. So how does this relate to today? We have high unemployment and a bifurcated labour market. We have supply-side extravagance in consumer goods and services, though not in essential goods such as energy, food and housing. And we have failure of aggregate demand, which stubbornly refuses to recover despite the loosest monetary policy in history – except in the Eurozone, of course, where they are operating a monetary system that looks like a Gold Standard on steroids and the central bank is in a fiscal and political straitjacket. The continuing failure of aggregate demand is the reason for the “secular stagnation” theory. If there was tight monetary policy in the Long Depression, and loose monetary policy now, why does the outcome appear to be the same? Could it be that the monetary policy stance is actually irrelevant? And if that is the case, then what is the real cause of the failure of aggregate demand, and what should we do about it? In “The desert of plenty”, I observed that governments desperate to create jobs, and investors desperately searching for yield, are crowding into the same waterholes. In other words, when prices are generally falling due to over-supply, there is competition between governments and private sector asset holders for increasingly scarce value. The loose monetary stance of recent years amounts to an attempt by governments to hijack the waterholes and crowd out investors. This is supposed to force investors to invest productively, generating new business and jobs. But the falling prices that depress demand by definition also depress return on investment, and central banks’ actions depress that return still further. On this basis, therefore, “loose” monetary policy appears deflationary. But central banks’ interventions have two sides. Low interest rates and unconventional policy instruments depress returns on investment, but they also support asset prices. Investors lose on yield, but they gain on price. Or, putting it another way, investors may be crowded out of the waterholes that central banks want to occupy, but that doesn’t mean they are forced into a deflationary desert. On the contrary, when the central bank forces them out of one waterhole it obligingly provides them with another. We therefore see pockets of rising prices, mostly in various classes of asset. However, not all investors trust centrally-managed waterhole allocation, so some are creating new waterholes of their own: Bitcoin, for example. If investors don’t want to make the desert bloom, because they can’t see that there’s anything in it for them, they won’t. They will create new waterholes and defend them against all comers. What doesn’t seem to happen much is leakage of the contents of the waterholes into the desert. If anything, the movement is the other way – the surrounding area is drained to create the waterholes. So, for example, rising property prices benefit existing homeowners but make housing more expensive for everyone else. This depresses demand in the wider economy, as those who have to pay more for their housing cut other spending. Indirectly, therefore, the property market becoming a waterhole for investors has a deflationary effect, although the direct effect appears inflationary as housebuyers are forced out to cheaper areas, pushing up prices there. Similarly, when commodities become waterholes, prices rise in essential goods such as fuel and foodstuffs, depressing demand in other sectors. And the most draining waterhole of all is Bitcoin, which is currently wasting enough energy to power a small country – energy that could be put to much more productive uses. The deflation associated with a persistent excess of supply over demand is anything but benign, and as the Long Depression shows, it is surprisingly difficult to deal with – not least because the “winners” in such an environment are asset holders and those with high incomes, whose political power enables them to oppose measures that really would address the aggregate demand problem, such as a basic income, public sector investment to replace the investment that the private sector refuses to do, and punitive taxation of rents. We have played this scene before. And last time, it ended very badly indeed. The imperial expansion and trade wars of the late 19thcentury ended with a cataclysmic war: war, after all, is a highly effective (though destructive) demand stimulus. A lot of people stand to lose in the desert of plenty – and they are not voiceless. We might perhaps escape war, but we already appear to be in the throes of some kind of revolution – and revolutions don’t tend to end well. The unemployment, poverty and inequality of the “desert of plenty” are not a failure of monetary policy. They are, above all, a political failure. *France was the principal driver of punitive reparations imposed on Germany after WWI, and the principal enforcer, too: it was French seizure of the Ruhr after Germany defaulted on its reparations that triggered the worst period of the Weimar hyperinflation. Memories are long: I wonder if France’s treatment of Germany at that time arose from resentment of the reparations it had previously paid to Germany itself. 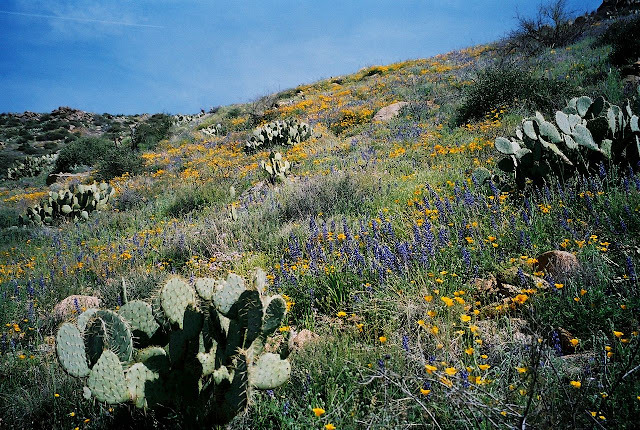 Image of flowers in the desert is from Wikipedia.